Enjoyed by members and visitors alike, Joe Morgan-Payler’s visit was a great success with an excellent demonstration and a full day and evening of workshops. For a change, members were invited to bring trees they would like Joe to work on and he would decide which tree he would develop. There was plenty to choose from and all of it ‘great material’. 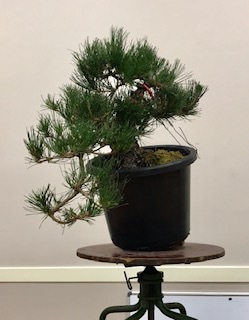 In the end, Joe chose a large Japanese black pine (on turntable) in the early stages of development for its impressive base, great trunk and early branch structure with a view to ‘set things on the right track for the future’. Before starting to work on a tree, Joe assesses the tree’s health. In this case, the pine had very healthy green needles (no grey needles indicating disease), plenty of new buds and gave every indication of being a vigorous tree. However, as it was March and the tree active, no heavy bending would be undertaken as the risk of ringbarking would be too great due to the pillar of sap between the bark and hardwood. Next, Joe looks at the movement and direction of a tree and is very aware of creating a dominant flow to the tree, commenting that ‘if something is not quite right, then the tree is probably too symmetrical or the flow is wrong’. Usually this can be remedied by shortening the branches on one side and leaving the other longer. The first branch sets the plan for the rest of the tree. With that in mind, Joe then removes unnecessary branches but always considers what will fill the spaces created by this, for example, is there a branch further back that will do the job? Joe likes consistency in the angle of the branches on each side of the tree- they do not need the same angle as each other but must look like the ‘forces’ have acted consistently on that particular side. Joe usually uses ‘muscle memory’ when pruning but will sometimes have to judge strength and balance to make a decision. Joe looks at wiring as ‘a bit of a puzzle’ that needs working out. It is very challenging to get it perfect but it is worth the effort because with wiring ‘neatness is directly linked to effectiveness’. If a wire is too loose, it is easier to break a branch and if wires cross, the pressure at that point is increased and so more likely to cut in. 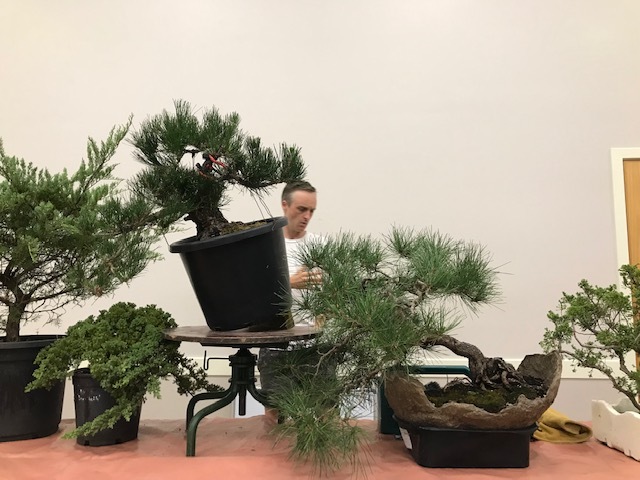 For evergreens, like pines, He uses copper wire because it stays where it is put and aims to set branches in a smooth line that flows like a highway off-ramp. Joe wires from the trunk out but sets branches from the tip inwards as it is easier to set pads as you go in. By placing branches correctly, giving everything its own space, a full-looking branch is created. 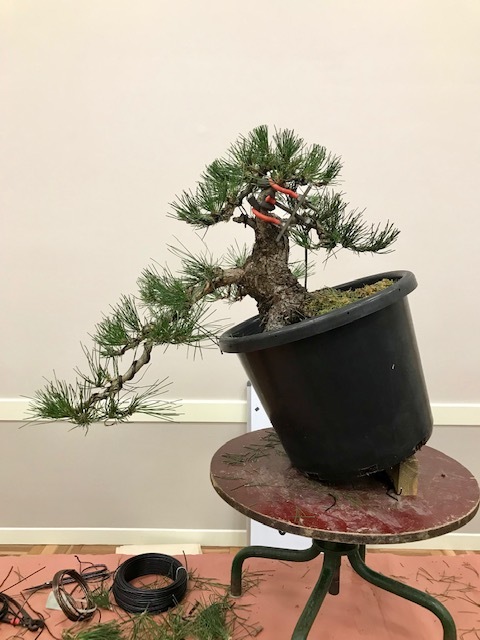 After setting the sub-branches (secondary and tertiary) there are always some branches that aren’t upright- correcting these is a fast way to turning an OK wiring job into an excellent one! Wiring does damage just by its nature and in effect why the branches change position and so it is sensible to leave wire on as long as possible, ideally a season. Should wire bite before this, just remove the offending bits and rewire there. For this pine, the most notable feature is the girth of its trunk. There are not many pines around this thick and so it should be a major feature of the tree. To accentuate this, Joe’s plan is to make the tree as compact as possible. The first branch had already had a guy wire (or twitch as Joe calls them) attached and so would bend further. A new guy wire was attached using the branch’s wiring and pot as an anchors and the branch further lowered. This area was changed from a junction of four to three, the stump removed and the remaining two back branches wired. Again a guy wire was used to bring the back branch down and into harmony with the first branch. Smaller branches were then set- bringing some down or over to the opposite side to fill empty spaces. The second branch had a long section without needles, so it was reduced to improve balance. The bender was left in place and pruned around. While the canopy was fairly straight forward- the crown had to be compact, long on one side and short on the other. Pruning was only started after looking carefully and manipulating the branches to see what would work to accomplish this. Finished tree- bones in place with needle plucking and candle pruning the way forward from here. This tree is now moving towards refinement and might be show ready in five years, however, a more realistic time frame is probably 8-10 years. Needle plucking and candle pruning are its future program.